One of the benefits of the Star Wars comic book by Brian Wood is the focus on various characters and their interactions. Wood has done an excellent job capturing the essence of these beloved characters, and his interpretation of their actions and behaviors is spot-on. Take Han and Chewie, for example. In the movie, most of their interaction is minimal. It is inferred that the two of them have a deep bond, but we don’t see much of their relationship other than occasional joking and Han telling Chewie to chill out. Wood’s Star Wars brings a more realistic relationship between the two characters. When Han and Chewie must escape Imperial troops on Coruscant, we see the trust the smugglers have for each other. Han, desperately trying to outmaneuver the TIE fighters, does not directly reject Chewbacca’s decision to get on the roof of the Millennium Falcon and personally shoot down the ships. The two characters are a well-oiled machine, a force to be reckoned with. Another character we don’t see much action from in the movies is Mon Mothma, one of the very few women in the original trilogy. From the movies, we understand she has a position of power in the Rebellion. Wood brings her to the forefront, highlighting her unwavering dedication to the cause as well as the power she has in her station. When a bridge officer questions Mothma’s decision to keep a certain group of X-Wing pilots off the book, she reassures him that everything she does is for the Rebellion. Her words (and previous actions in her position) are all the officer needs to keep quiet on the subject. Like any Star Wars story, a space battle takes place in this issue. With Luke grounded, Leia personally leads her secret group of Rebels to find a new base and ferret out the spies. 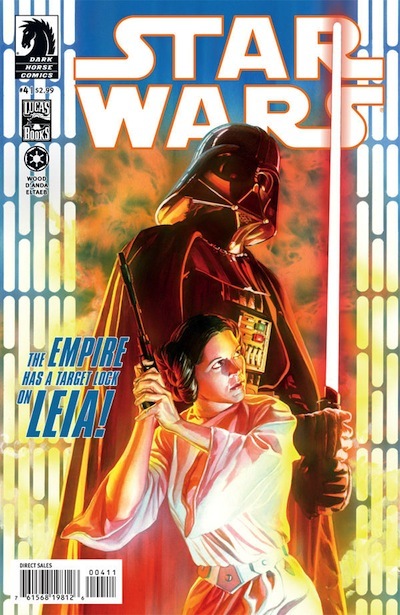 As with previous issues in this series, Leia is portrayed as strong, smart, and courageous beyond her years. When things quickly go south, Leia is not afraid to make her stand to protect the Rebellion. You’re buying this issue, right? Star Wars juggles so many characters, and Wood is able to give the spotlight to them all. He has set the comic up to weave everyone’s stories in and out of each other. This issue has done a fantastic job of featuring several characters without it feeling rushed or formulaic. The reader gets the information they need and can apply it in the next setting without missing a beat. The artwork accompanying the story is perfect. Even with the X-Wing helmets on, D’Anda has made distinctions between the various characters. That is certainly a difficult task, yet D’Anda made it look effortless. Pick up Star Wars and get ready for a series that hits all the right notes.